My commitment to encouraging women is based on what I encounter in Scripture. Many Complementarians, those who believe men are called to leadership and women are not, like to suggest that their perspective is the “biblical” perspective but I strongly beg to differ. I am, after all, an Egalitarian. As we exegete Scripture and do our best to understand the sociological and cultural backdrop of the Scriptures, I can’t help but reach the conclusion that Paul did not intend to prohibit women from leading in churches. Moreover, Jesus’ interaction with women throughout his public ministry, not to mention the fact that women were the first eyewitnesses to the Resurrection (who then taught the Apostles about it), seems to suggest that the perspective that women were second class humans, often treated as property, who were not trusted to have the ability to lead was being undermined by the coming of the Holy Spirit and the in-breaking of the Kingdom of God. This has been well articulated by Craig Keener (Paul, Women, & Wives), Don Williams (The Apostle Paul and Women in the Church), a host of scholars in Discovering Biblical Equality, Michael Bird’s Bourgeois Babes, Bossy Wives, and Bobby Haircuts, and more recently in Gary Hoag’s published doctoral dissertation, Wealth in Ancient Ephesus and the First Letter to Timothy, not to forget the hermeneutical observations of Scott McKnight’s The Blue Parakeet and William Webb’s Slaves, Women & Homosexuals. I mention these scholars for (1) full disclosure to the biblical-theological influences I find most convincing and (2) for those of you who are looking for resources. There are numerous biblical and theological reasons why I believe that discouraging women from serving in leadership actually hurts people and robs the church from being fully resourced and effective. Gordon Fee has convincingly argued that the Church should give the Holy Spirit priority in gifting whomever the Spirit chooses to gift with whichever gifts the Spirit gives. Therefore a significant theological reason to encourage women to use their leadership gifts is the Spirit himself. Secondly, if we take seriously the task of understanding Scripture in its original context, we need to consider Gary Hoag’s research on Xenophon of Ephesus’ influence on Paul’s instructions to Timothy in 1 Timothy 2. Paul did not intend for woman to “remain silent” for all time. His comments were related to a specific contextual situation and any attempt to impose Paul’s words today overlooks the actual intent of Paul. In fact, I believe to impose Paul’s words to the Ephesian women in the 1st century to women today does a disservice to Scripture and actually undermines the very authority of Scripture that is being allegedly championed. Third, Jesus’ interaction with women undermined assumptions about the role and sociological structures where women were traditionally situated in first century Israel. As Ken Bailey has argued in Jesus Through Middle Easter Eyes, Jesus not only treated women as fully equal to their male contemporaries, he included them in his inner circle of disciples, trained them, and encouraged their non-traditional inclusion in ministry. According to the Complementarian readings of Scripture, women shouldn’t lead men because women are called to submit to male leadership. Great emphasis is placed on the need for wives to submit to their husbands, as well as male leadership, because the New Testament “clearly” commands women to do so (cf. Eph. 5:22-24; Col. 3:18; 1 Peter 3:1-6). Of course, rarely do advocates of this perspective acknowledge Paul’s command that all Christians, regardless of gender, “submit to one another” (Eph. 5:21) or much discussion provided on the implication of Paul’s command to the Corinthians to “submit” to Stephanas and his household in 1 Corinthians 16:15-17. While Paul does not name everyone in Stephanas’ household, it seems reasonable that there were women in his family whom the church, both men and women, were to submit to. What stands out in Complementarian literature is the emphasis on women submitting and men leading. They argue that what we read in the New Testament about women submitting to male leadership is a command that still stands. We are told that by God’s design, women aren’t called (or gifted) to senior leadership positions the church. Human beings/slaves are considered to be property (Exod 12:44; 21:20– 21, 32; Lev 22:11). Foreign slaves in Israel did not experience the seventh year of release (Lev 25:39–46). Slaves within Israel were used to produce offspring for their infertile owners (Gen 16:1–4; 30:3–4, 9–10; cf. Gen 35:22). Sexual violation of a betrothed slave woman did not lead to death as in the case of a free woman (Deut 22:25–27), but to a mere payment/ offering for damages (Lev 19:20–22). A bull owner’s liability for their animal goring a slave to death (com- pared to a free person) shows tremendous inequality in terms of the value of human life (Exod 21:28–32). Slave owners were permitted to beat their slaves without any penalty, provided the slave survived and could get up after a couple of days (Exod 21:20–21). In today’s modern world, everyone agrees that slavery is evil and that slaves should be freed and that it’s perfectly justified for slaves to do whatever they can to get out of their situation. In fact, I’ve asked numerous Complementarians if it would be “biblical” to tell slaves that they can “run away” from their masters and every single one of them has said, “Yes!” So the question I have is why do we allow slavery to get a free pass and women aren’t? It seems that it would be better to be a modern-day slave than a woman. Don’t get me wrong. I’m not suggesting that we should stop considering slavery evil. I’m also well aware of the fact that there were different types of slaves throughout the Bible. But I’m confused as to why some overlook the “clear” and “explicit” statements found within the New Testament concerning issues related to slavery but are very committed to maintaining the sociological structures of the ancient world when it comes to women. 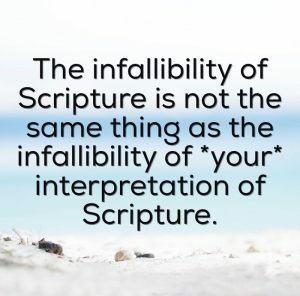 Quite frankly, it’s an inconsistent hermeneutic. Many of us would tell someone trapped in slavery that they should pursue freedom and get out of their situation, despite the “clear” biblical teachings of slaves obeying their masters, yet would inform women that they must continue to submit to male leadership and aren’t allowed to lead in a role over men. And sadly, many Complementarians aren’t willing to even acknowledge this problematic issue (I’m grateful to a few good friends whom happen to be “soft” Complementarians who acknowledge that this is an issue to wrestle with). Stop Ignoring Hermeneutical Challenges; Instead Engage! As I’ve indicated, I am committed to encouraging and empowering gifted and called women to pursue church leadership because that’s what I believe the Bible teaches. So I completely reject the common tactic from Complementarians who suggest that folks like myself are simply “ignoring” Scripture. A few years ago a friend of mine told me that the only way that someone could support women as pastors was if they decided the Bible was wrong on the matter. Not so fast, folks. Not so fast. The initial problem with this sleight of hand is that it simply isn’t true, not to mention that it’s often begging the question, circular reasoning, and absolutely a red herring. All of the Egalitarian scholars I have mentioned above, those who believe that women and men should be encouraged to lead based off of their gifting rather than their gender, appeal to the Bible as the source of authority.